Story Line: A successful hedge fund magnate on the verge of losing everything he’s worked for. As he waits for one last deal to go through that will secure his and his family’s livelihood, tragedy strikes which threatens to unearth some hidden secrets, putting his fortune, his family and his future in jeopardy. An outstanding screenplay delivered by mature and pitch-perfect performances. 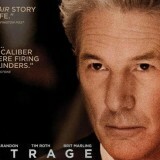 Arbitrage stands proudly and deservedly at the top of its class. A genuinely mature, thrilling, powerful movie which is expertly and remarkably delivered by a first time director, it’s possibly the best film of 2013 so far. Richard Gere is on superb form in director Nicholas Jarecki’s outstanding debut about a successful hedge fund magnate on the verge of losing everything he’s worked for. As he waits for one last deal to go through that will secure his and his family’s livelihood, tragedy strikes which threatens to unearth some hidden secrets, putting his fortune, his family and his future in jeopardy. Gere’s Robert Miller is a man used to having all that money can buy and the respect that comes with it. He has loyal employees, friends, and a doting family which included the always reliable and solid Susan Sarandon as his wife but more notably, first rate support from one-to-watch Brit Marling (writer and director of the wonderful Another Earth), as his daughter and protégé. However, we learn early on that Miller is a man with secrets, and when these secrets are at risk of being revealed, Gere’s suave, calculated and charismatic Miller cracks under the strain and the pressure as he tries to keep everything together. Character driven films such as these are always at risk of alienating the audience when the protagonist not only belongs to a world that the audience may not be able to relate to but also when the protagonist is somewhat of an antihero. We need to be able to care about what’s going to happen to this character, be it their redemption, comeuppance or resolution. It is therefore testament to an outstanding screenplay (along with Django Unchained, arguably the best screenplay I’ve enjoyed in some time) as well as Gere’s terrific performance and Jarecki’s inch-perfect pacing of bubbling tension and atmosphere that I felt completely invested in the story and the characters and drawn into this world, enthralled by the continuously unfolding events which heap on the pressure for Miller to deal with. Throughout, I couldn’t help but draw comparisons with Paul Thomas Anderson’s There Will Be Blood, albeit on a smaller scale. Gere’s Robert Miller and Daniel Day-Lewis’ master class performance as Daniel Plainview are both characters driven by money and power (although greed itself is not so much a theme in Arbitrage), both are determined, focused and calculated in their mission to succeed and be the best at what they do and both will do absolutely anything they can to prevent anyone or anything risking their empires. Aside from the similarities with the protagonists, the two films also share a steady, unnerving and atmospheric pacing that builds nicely to a perfectly crafted climax, and both are aided in doing so by creative and exquisitely timed music that lends an added element of completeness to each scene in which the music is utilized. I personally regard There Will Be Blood to be a masterpiece of cinema. Despite drawing comparisons, I’m not convinced that Arbitrage quite reaches those heights, although I’m hard pressed to think of a single negative comment to make about it. There Will Be Blood just had that added quality, that little bit extra which raises it above the majority. 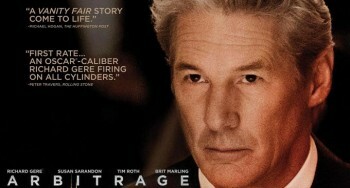 Of that majority, though, Arbitrage stands proudly and deservedly at the top of its class. A genuinely mature, thrilling, powerful movie which is expertly and remarkably delivered by a first time director, it’s possibly the best film of 2013 so far for me.